HMAS Labuan (II) commissioned into the RAN on 9 March 1973 at Walkers Shipyard Maryborough having been accepted from the Army earlier in the day. 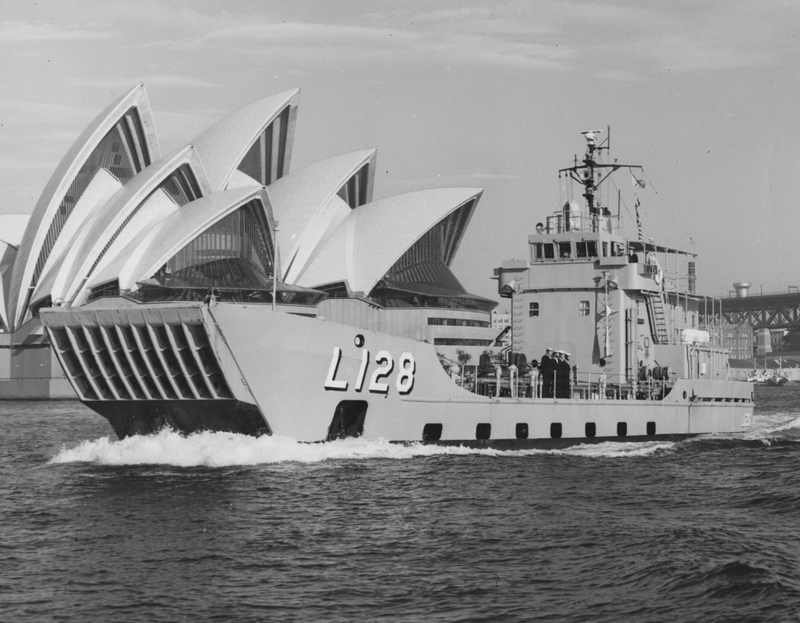 She was one of six Landing Craft Heavy (LCH) vessels to join the First Australian Landing Craft Squadron based at HMAS Moreton in Brisbane. Following a work-up program that saw her visit Bundaberg and Sydney, Labuan embarked a detachment from Clearance Diving Team One (CDT1) on 23 May to investigate a WWII torpedo discovered in a state of ongoing decay at Moreton Island. The object, which turned out to be a live warhead, was subsequently located and destroyed that afternoon. HMAS Labuan leading the LCH squadron. Labuan undertook her first overseas deployment in August arriving in Port Moresby, Papua New Guinea, on the 15th with a detachment from CDT1 embarked. Over the next two months, she visited Salamaua, Madang, Kar Kar Island, Kairiru Island, Tong Island, Djaul Island, Kavieng, Boang Island, Rabaul and Kandrian transporting CDT1 and its equipment to perform civil tasks such as reef passage clearance operations and explosive ordnance disposal tasks. Crew members also participated in public relations exercises with local communities. CDT1 disembarked on 12 October for return to Australia by air. Following the Team’s departure, Labuan travelled some 135 miles up the Fly River conducting an echo sounder survey. She departed Papua New Guinea on 19 October in company with her sister ship, HMAS Brunei arriving in Cairns three days later. Following the deployment to Papua New Guinea, Labuan settled into a routine of exercises, maintenance and support tasks for both Army and Navy units off the east coast of Australia, a routine which became very familiar. She also occasionally provided training for RAN reserve sailors. 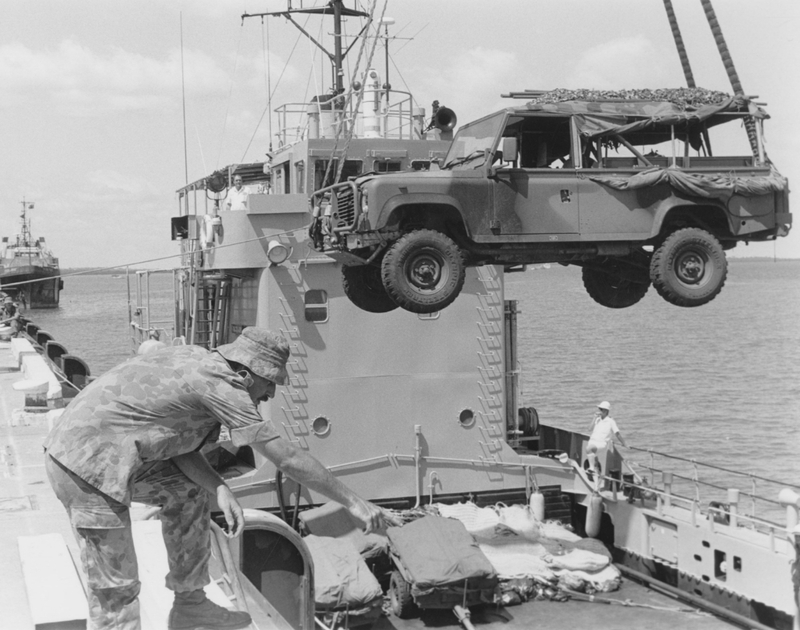 Most of her commitments for the remainder of the 1970s involved a busy schedule of sea-lift support for both the RAN and the Australian Army. She participated in the Army Exercise TEMPLE TOWER in November 1973 following which she was tasked to come to the assistance of one of the more remarkable expeditions in recent maritime history, known as the Las Balsas Expedition. On 27 May three rafts measuring some 50 feet long and 20 feet wide, made of balsawood and held together with wooden pegs and hand-made sisal ropes, departed Guayaquil in Ecuador bound for Mooloolaba, Queensland. 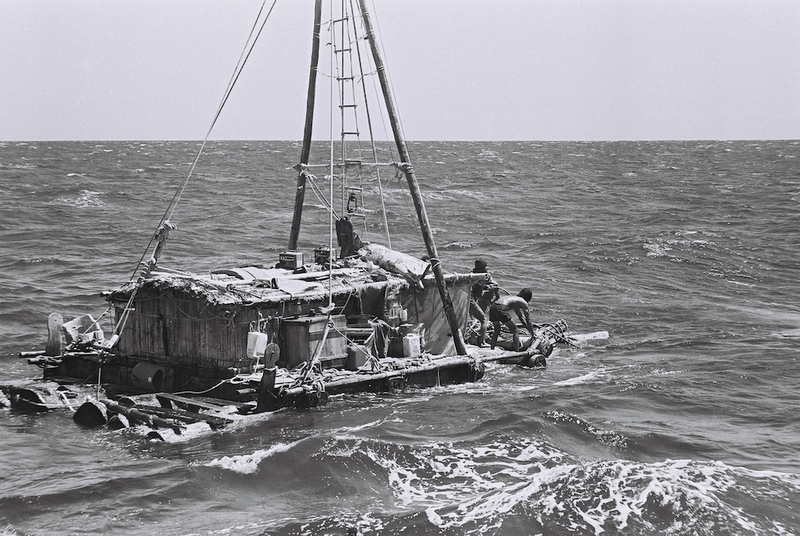 Each raft, named Guayaquil, Mooloolaba and Aztlán, had a crew of four and a small shelter to protect them from the elements on their 14,000 km journey. The rafts were replicas of traditional rafts used by South American natives before the arrival of Spanish explorers in 1526. With the weather and tide against them, the expedition, having successfully crossed the Pacific Ocean, faced the prospect of seeing their rafts destroyed by the tide upon landing, so Labuan departed Brisbane on the morning of 19 November to render assistance. She rendezvoused with the rafts that evening and, after transferring some hot food and other provisions, took the trio in tow. It soon became apparent that the prevailing conditions and the inability of the rafts to sustain a high speed tow precluded landing at the original destination of Mooloolaba and an alternative landing at Tweed Heads was also deemed impossible to attain. Further complications arose when the tow line to Guayaquil parted in the early hours of 20 November and, rather than prejudice the tow of the remaining two rafts, the decision was made to continue the tow and return for Guayaquil. Having radioed ahead, Labuan was met off Ballina by two trawlers that morning and transferred the tow before returning for Guayaquil. 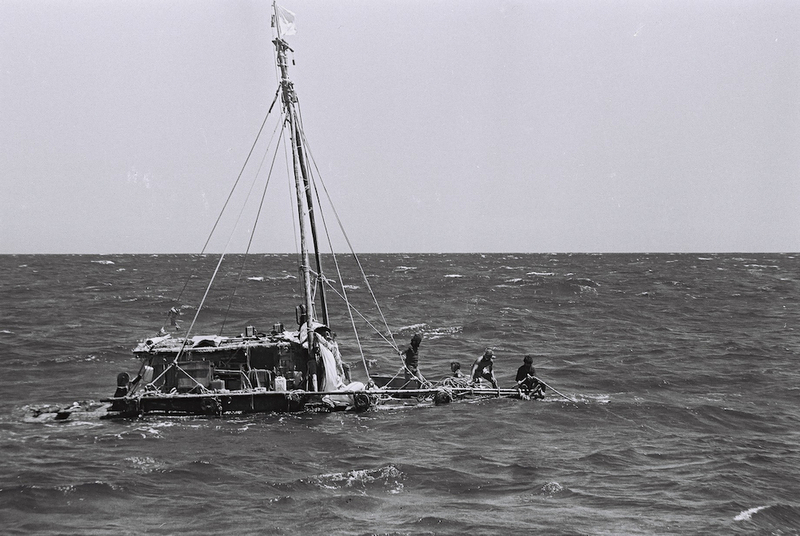 She rendezvoused with the raft early that afternoon and recommenced the tow, however, with the weather worsening, the raft’s crew was transferred to Labuan before the tow line once again parted and the raft was lost, later to wash up on a beach near Newcastle. Labuan arrived at Ballina with Guayaquil’s crew the following morning. A raft, the result of combining 'the best' of the two rafts that successfully landed in Ballina, is now on display at the Ballina Naval and Maritime Museum. 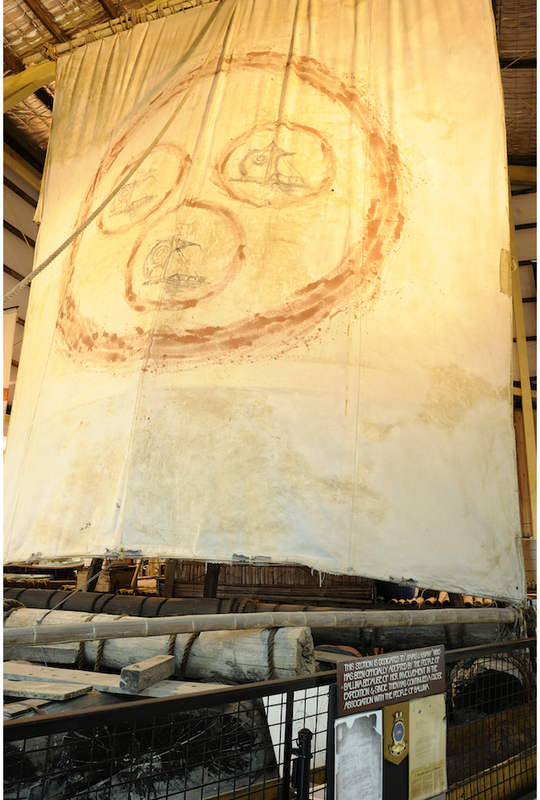 One of the rafts from the Las Balsas expediton now on display at the Ballina Naval and Maritime Museum. In March 1974 Labuan departed Australian waters for Singapore via Cairns, Darwin and Benoa, Indonesia. She transported army stores and equipment between Singapore and Belawan, Indonesia, in April, and returned to Australia, via Surabaya, the following month. Labuan participated in the multi-national Exercise KANGAROO ONE in June 1974 which included some 15,000 servicemen, 38 ships and 120 aircraft from Australia, New Zealand, the UK and the USA. She also participated in Exercise KENTIA PALM in September transporting materials and equipment to Lord Howe Island for the construction of an airfield, and in October and November embarked a Clearance Diving Team detachment to conduct surveys of the Great Barrier Reef to study the spread and effects of the Crown of Thorns Starfish. On the evening of 16/17 November, while anchored off Kangaroo Reef, she provided assistance to MV Coral Reef, also participating in the Crown of Thorns survey, after she dragged and damaged her anchor in heavy weather and was, at one point, on a collision course with Labuan. 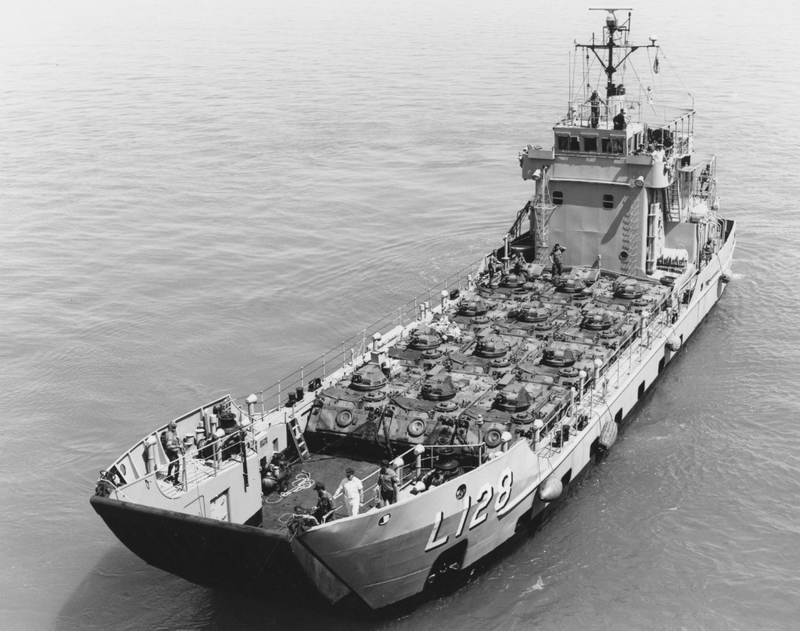 On 24 February 1975, while participating in Exercise WAGON TRAIN II, Labuan was holed above the waterline forward on the starboard side when she collided with a lighter while attempting to connect a tow wire. The damage was repaired the following day in Newcastle. HMAS Labuan transporting two of the RAN's new Sea King helicopters in crates to Jervis Bay. Further army support operations took her to Melbourne, Whyalla and Adelaide in April and early May, and on 12 May she embarked the first two of the RAN’s new Sea King helicopters at Darling Harbour before transporting them to Jervis Bay. After disembarking the crated aircraft the following day, she rescued two fishermen in Jervis Bay whose boat had been swamped. Participation in Exercises: BOUNTY RIDER, SANDY HILL and EMBARKEX II followed in May, July and August respectively. 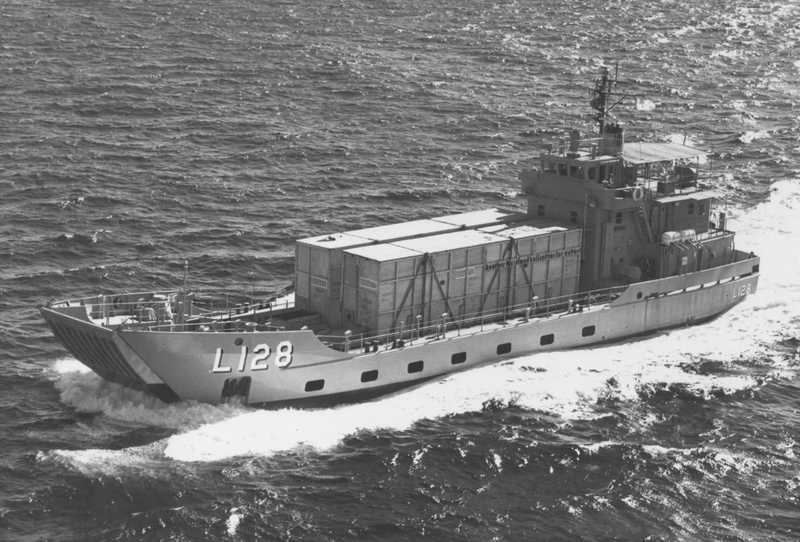 Labuan returned to southern waters in 1976 providing sea-lift for the army between Bell Bay in Tasmania, and Geelong before taking part in Exercise SEAWAY in Victorian waters in May as well as making an operational visit to Adelaide. She participated in Exercises SEAHOUND and KANGAROO II in July and October respectively. She deployed to South East Asia in September 1977 visiting Benoa, Surabaya, Singapore, the island of Labuan and Sorong before arriving at Biak on 6 October to extract equipment used during Operation CENDERAWASIH, a series of mapping and charting operations conducted in the Province of Irian Jaya, Indonesia. She arrived back in Townsville, via Lae and Port Moresby, on 25 October. 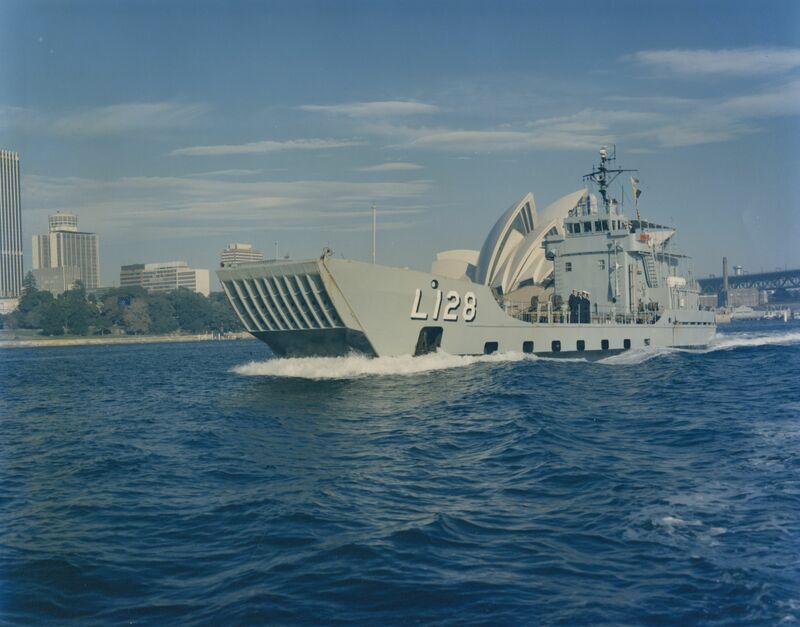 HMAS Labuan in Sydney, November 1977. In June and July 1978 Labuan was involved in Operation BEACHCOMBER in north-west Australian waters, a series of major inter-service surveying operations the aim of which was to gather information on the beaches and hinterland of Australia’s northern coastline between Brisbane and Geraldton. She handed over BEACHCOMBER responsibilities to her sister ship, HMAS Betano, on 31 July. Exercises MUDLARK and ROCK WALLABY in October and November followed respectively before entering refit on 12 February 1979 in preparation for her transfer to the Royal Australian Navy Reserve (RANR). Labuan was officially transferred to the Brisbane Port Division of the RANR on 15 June 1979. 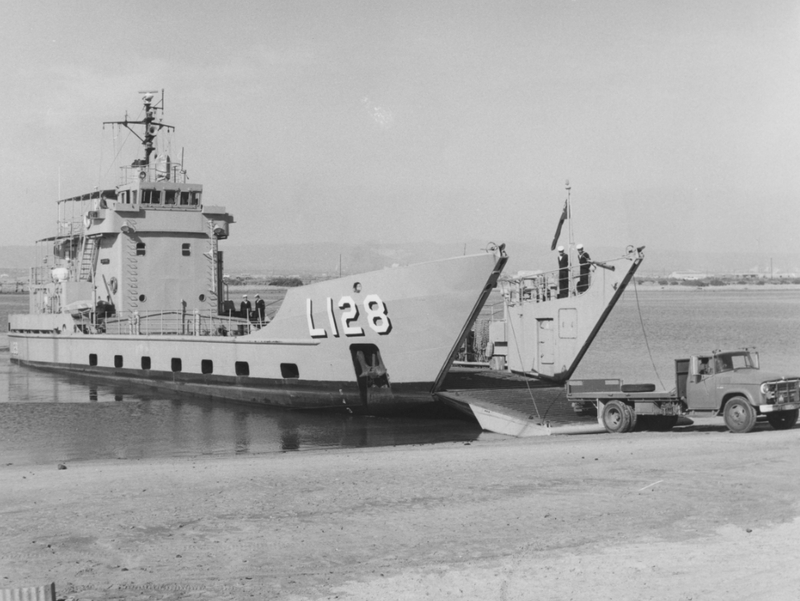 HMAS Labuan beached, circa 1978. Labuan served in that capacity for the next thirteen years providing training to rotating RANR crews for two weeks at a time, primarily along the east coast of Australia. This was in addition to regular weekend training and ‘day-runs’. She continued to provide army and fleet support, when operational, as required, as well as supporting hydrographic operations. She participated in Operation CAPRICORN AFFAIR in June and July 1979, Exercise KANGAROO III in October, and Exercise GOLDEN STRAND in August 1980. Labuan visited Honiara, Solomon Islands, on 20 September 1980 where a complete change-over of her RANR crew was conducted the next day. With a Clearance Diving Team detachment embarked, Labuan spent the next three weeks conducting channel clearance operations around the Solomons, as well as civic and public relations operations. A second crew change-over was conducted on 10 October for the return passage to Australia, arriving in Brisbane, via Cairns, on 24 October. Her busy scheduled continued with participation in Exercises NORMANBY RANGER and KANGAROO 81 in 1981, DIAMOND DOLLAR and GLENCOE in 1982, and DIAMOND DOLLAR again in 1983. The ship’s company marched through the streets of Ballina on 8 June 1985 as part of the city’s twelfth annual Kingsford-Smith Festival before once again participating in Exercise DIAMOND DOLLAR in July. She was temporarily manned by a Permanent Naval Force (PNF) crew in October and November 1985 to participate in Exercise TASMAN WARRIOR 85. The ship’s company again marched through the streets of Ballina on 8 June 1986 to celebrate the 75th Anniversary of the Royal Australian Navy. During that year she also took part in Exercises DIAMOND DOLLAR, KANGAROO and FULL PACK. The completion of Exercise INITIAL LANDING in April 1987 saw Labuan in transit between Ballina and the Gold Coast. In the early hours of 9 April a red flare was sighted inshore and she proceeded to investigate. The pocket maxi yacht Madame de Farge had run aground on Jumpinpin Bar between North and South Stradbroke Islands while participating in the Sydney to Mooloolaba Yacht Race. After rescuing the eleven man crew, Labuan directed local coast guard vessels to the stricken yacht which was refloated just before dawn and towed to safety. HMAS Labuan with 12 APCs embarked for exercise KANGAROO, August 1989. 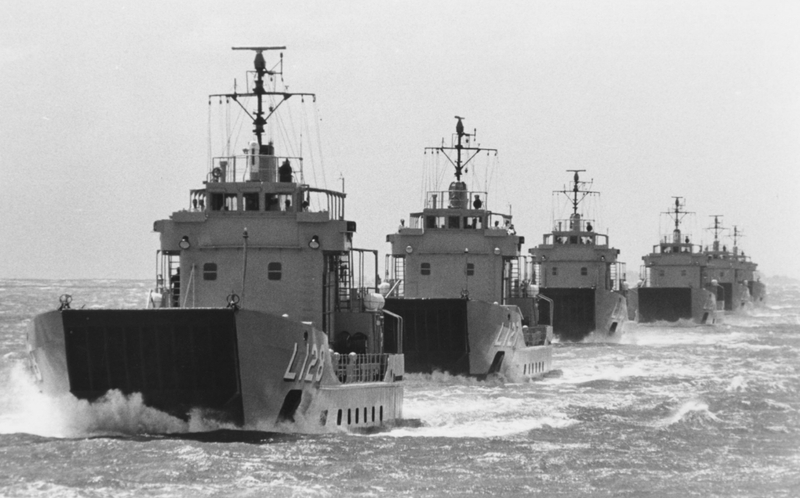 Labuan again took part in Exercise DIAMOND DOLLAR in 1987 and returned to Ballina in January 1988 to participate in Bi-centennial celebrations. Later that year she visited Sydney in September and October take part in the Bicentennial Naval Salute. The program of steady exercising continued with involvement in Exercises INITIAL LANDING in 1988 and 1989, KANGAROO in 1989, EMERALD CENT in 1990 and SQUADEX in 1991. She conducted her final RANR training cruise in January 1992 before undergoing a refit in Cairns prior to recommissioning into the PNF. Labuan officially resumed service in the PNF in Brisbane on 17 August 1992 with a partial crew and while still progressing the final items of her refit. Without a command team yet assigned to her, her first few weeks back in the PNF saw her under the command of a quick succession of different temporary commanding officers. However, this did not prevent her from settling into a familiar routine of exercises, maintenance and support tasks for both the army and navy. HMAS Labuan disembarking Army vehicles during Exercise KANGAROO, 1992. On 18 September Labuan sailed with an integrated PNF/RANR crew to support a Naval Reserve Cadet sailing expedition in the vicinity of the Great Sandy Straits. The following year she participated in Squadron exercises in January and February 1993 before entering the Forgacs Shipyard in Newcastle on 31 March for asbestos removal. She was back at sea by 3 May in time to take part in Exercise TASMAN LINK 93. Labuan departed HMAS Moreton for the last time on 19 August 1993 firstly to participate in Exercise EAGLE FLIGHT II before heading for her new homeport of Cairns, ending a 20 year association with the city of Brisbane. She participated in Exercise DUGONG 93 in November and December. The ship’s company was recalled from leave on New Year’s Eve in order to sail north to avoid Tropical Cyclone Rewa, which lasted for 25 days claiming 22 lives across the South Pacific and four in Brisbane when it reversed to cross he Queensland coast in January. Labuan participated in Exercise READY SHIELD in January 1994 before the return of Rewa brought about an early end to the exercise. Always in demand, Labuan, was fully employed exercising throughout 1994 taking part in: Exercises SQUADEX 94, INITIAL LANDING 94, SCORPION STING, TASMAN LINK 94 and RISING DAMP. A visit to Tasmania saw her provide training for Naval Reservists based in Hobart in August before taking part in Explosive Ordnance Disposal Training in November. Between 15 February and 5 June 1995 Labuan underwent a minor refit before resuming the normal pattern of exercises and training. She was involved in: Exercises PARADISE in Papua New Guinea waters, and KANGAROO 95, and in November participated in Operation PROWLER, involving the collection of geographic data in northern Australia and providing logistic support to elements of NORFORCE in the Northern Territory. She again participated in SQUADEX in February 1996, and in the evening of 14 May, while participating in Exercise THUNDER BAY 96, ran aground on a reef north of South Harrison Island. She was refloated at high tide the next morning and underwent temporary repairs at Sabina Point before returning to Cairns for a full assessment of damage and repairs. With repairs complete Labuan picked up where she left off participating in Operation PROWLER, Exercises SWIFT EAGLE 96, SQUADEX 2-96, the Cairns Coastguard Boat Show and the Cairns Reef Festival. Exercises TANDEM THRUST 97, which was disrupted by the presence of Tropical Cyclone Justin, and KAKADU III followed in 1997. On 22 March 1997, Labuan was placed on standby for Operation BARITONE, the Australian Defence Force’s contingency plan to evacuate Australians from Papua New Guinea following political unrest there. It transpired that she was not required and she was consequently stood-down in early April. That October she deployed to Western Australian waters for Operation BEACHCOMBER, an ongoing hydrographic operation along Australia’s northern coastline, at the conclusion of which, on 12 November, she sailed from Darwin in support of Operation SIERRA, the RAN’s drought relief operations in Papua New Guinea. Labuan spent the next three weeks transporting food, water and other essential supplies to drought-stricken areas in the Papua Gulf, Milne Bay and surrounding islands. She arrived back in Cairns on 11 December where she entered a maintenance period incorporating extensive upgrades to her communications centre. She participated in Exercise TASMAN LINK 98, and Operations PROWLER and BEACHCOMBER in 1998; and Exercises SQUADEX, INITIAL LANDING 99, and PARADISE in Papua New Guinea waters in 1999. On 18 September 1999, Labuan sailed as part of the multi-national INTERFET Task Group 627.1 for Dili, East Timor, under the auspices of Operation WARDEN-STABILISE. As well as providing a logistics over the shore capability, she also provided ‘hotel’ services for INTERFET forces ashore. She departed the Area of Operations on 14 October. She deployed to East Timor again in November-December 1999 (twice), February-April 2000, June-July 2000 (Operation TANAGER), August-September 2000 and November-December 2000. 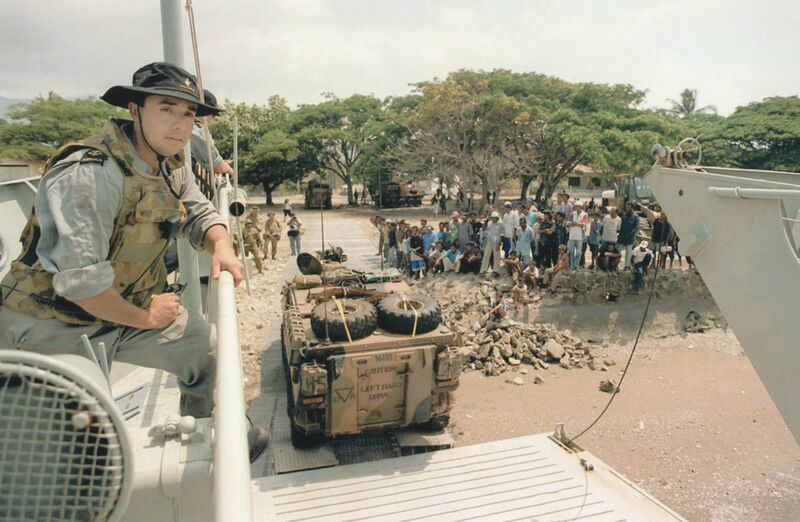 Labuan unloading 2nd Cavalry Reg ASLAVs in Dili Harbour, 10 October 1999. Upon her return to Cairns from East Timor in December 2000, Labuan began preparations for a Life of Type Extension which officially commenced on 26 February 2001. The extensive work package kept the ship alongside at the Tropical Reef Shipyard in Cairns until 7 September. She put to sea again on the 18 September. Less than a month later, on 15 October, she departed Australian waters to return to Bougainville for Operation BEL ISI II. She arrived back in Cairns on 4 December. Labuan made a brief visit to East Timor at the end of January 2002 transporting military vehicles to Dili before returning to Bougainville in April for Operation BEL ISI II duties. Her deployment was extended when her programmed relief, HMAS Betano, suffered damage in heavy weather while en route to Bougainville requiring repairs at Cairns. Labuan was eventually relieved on 5 July and returned to Cairns. Further duties in Bougainville followed in September-October 2002 and April-May 2003 during which she transported an X-Ray machine donated by the Rotary Club Australia as a gift to the people of Bougainville. In 2003 she also participated in Exercises: SQUADEX 03 and SEA EAGLE 03 in March before departing for the Solomon Islands on 24 July under the auspices of Operation ANODE, the RAN’s contribution to the Regional Assistance Mission Solomon Islands (RAMSI). As well as providing logistic support to RAMSI forces ashore, Labuan conducted maritime patrols and assisted with the collection of firearms surrendered in accordance with the gun amnesty in force at the time. She departed the Area of Operations on 2 September, returning for future tasking in April-May 2004. Labuan was a participant in the Landing Craft Concentration Period in 2004 as well as Exercises: SQUADEX, SEA LION and SWIFT EAGLE. In November she paid a visit to her adopted ‘home port’ of Ballina for the first time in a decade. 2005 began with work-ups and participation in the Minor War Vessel Concentration Period in February-March before it was interrupted by the presence of Tropical Cyclone Ingrid. Later she provided support for Australian Quarantine and Inspection Services patrols conducted between April-May. In June she took part in Exercises TALISMAN SABRE 05 and PUK PUK, a combined Australia/ Papua New Guinea exercise to facilitate construction of essential services in PNG which required Labuan to transport equipment and personnel to Port Moresby. In March 2006 Labuan was involved in squadron exercises before the approach of Tropical Cyclone Larry saw her crew advised to secure their residences on 18 March and return to their ship the following day. She sheltered in Wahday Creek and the bulk of her crew, excepting a duty watch of four, were transferred back to Cairns by work boat. Cyclone Larry crossed the Queensland coast about 70km south of Cairns on the morning of 20 March and, having weathered the storm, Labuan returned to Cairns the next day to begin preparations to render humanitarian aid. She was assigned to Operation LARRY ASSIST from 23-26 March transporting equipment and supplies between Townsville and Mourilyan. Thankfully no lives were lost during Cyclone Larry, however, some 10,000 homes were damaged, crops were lost and the estimated damage bill was in excess of $500 million. HMAS Labuan's crew with members of 51 FNQ regiment during Operation RESOLUTE, 2006. In June 2006 Labuan deployed to East Timor under the auspices of Operation ASTUTE, making two voyages between Darwin and Dili. She conducted an Operation RESOLUTE patrol in August and returned to RESOLUTE duties in September and October 2006, and June 2007. 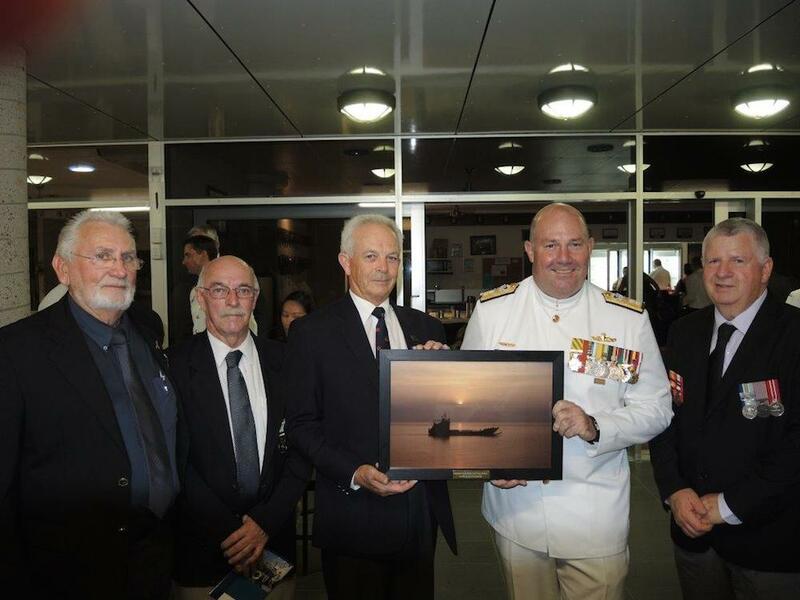 HMAS Labuan provided the catafalque party for the Anzac Day memorial service in Cooktown, 2007. In May and June 2008 she provided logistics over the shore support for the Australian Army Aboriginal Community Aid Program between Darwin and Kalumburu in Western Australia, and in August and September, she embarked scientists from the Defence Science and Technology Organisation, Curtin University and the Universities of Queensland and Sydney to conduct a world-first research survey of Beaked Whales in Australian waters. Labuan unloading Army vehicles at McGowan's Beach near Kalumburu, Western Australia, May 2008. Labuan departed Cairns, in company with HMAS Tarakan, on 24 April for a South West Pacific deployment visiting Vanuatu, Tonga and Western Samoa. The two ships arrived back in Brisbane on 4 June. Labuan continued to participate regularly in fleet and amphibious exercises, such as Fleet and Minor War Vessel Concentration Periods, over the final years of her commission. Top left: HMAS Labuan departs United States Naval Ship Mercy's port side after unloading cargo for PACIFIC PARTNERSHIP 2010 off the North Maluku Islands, Indonesia. Top right: Captain Lisa Franchetti, Commander PACIFIC PARTNERSHIP 2010 (centre) with some of the PACIFIC PARTNERSHIP team, including HMAS Labuan ship's company, on the tank deck of HMAS Labuan during PACIFIC PARTNERSHIP 2010. 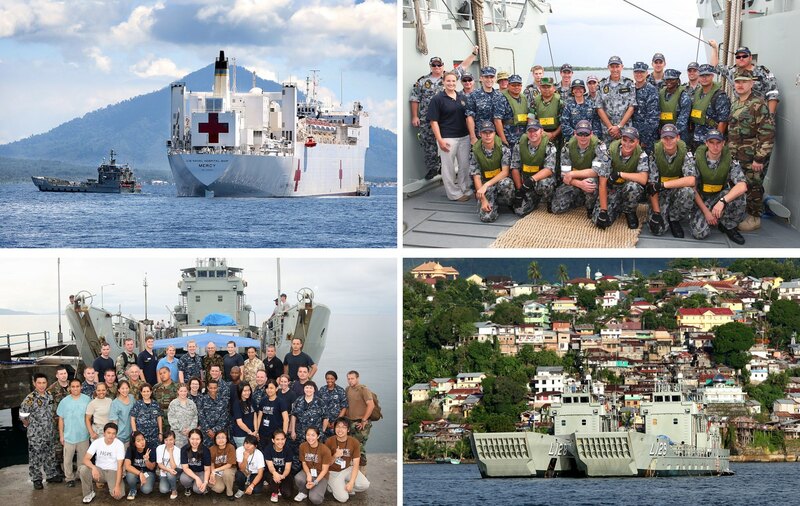 Bottom left: The Sofifi medical and dental teams on the wharf in front of HMAS Labuan during PACIFIC PARTNERSHIP 2010. United States Navy personnel and members of non-government organisations treated over 2000 patients over the course of the five day clinic. Bottom Right: HMA Ships Labuan and Tarakan at anchor in Ambon, Indonesia during PACIFIC PARTNERSHIP 2010. In July 2010 she participated in PACIFIC PARTNERSHIP 2010, an annual US-led humanitarian assistance mission providing medical, dental, veterinary, engineering and other community services to communities across South East Asia. 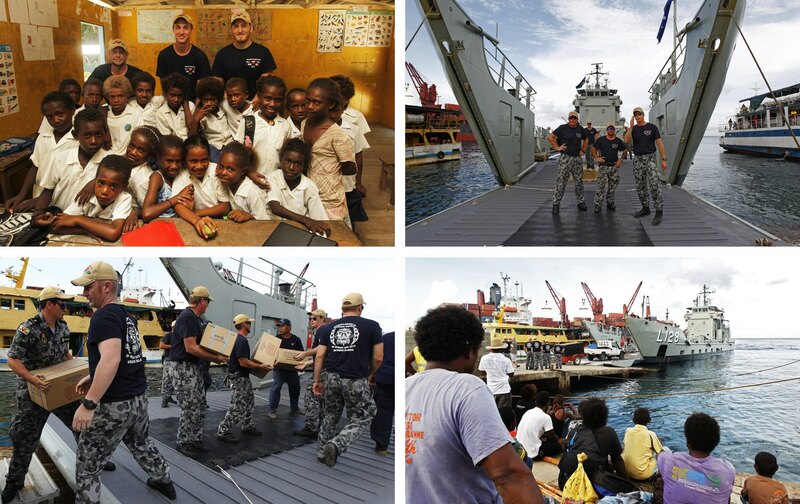 Labuan provided logistics over the shore support in Indonesia and Timor Leste, and provided accommodation and acted as a forward operating platform for medical and dental personnel from Australia, the USA, the UK, New Zealand, Canada, Portugal, South Korea and Indonesia. Left: Royal Australian Navy vessels, HMAS Tarakan and HMAS Labuan are reviewed by Her Excellency, the Honourable Quentin Bryce, AC, CVO, Governor-General of the Commonwealth of Australia from onboard HMAS Leeuwin during the International Fleet Review 2013. Right: A sailor onboard HMAS Labuan prepares to 'Cheer Ship' as part of the Minor Warships review procession during the Royal Australian Navy's International Fleet Review 2013. She participated in the International Fleet Review in Sydney Harbour in October 2013 commemorating the 100th Anniversary of the arrival of first RAN Fleet Unit in Sydney. The Fleet Review involved 37 RAN and international warships, 16 tall ships, more than 50 military aircraft and 8000 sailors. Top Left: Back row, from left, Able Seaman Boatswains Mate Caleb Eustice, Seaman Communication and Information Systems Connor White, Able Seaman Communication and Informations Systems Jackson Walkear of HMAS Labuan with classroom students of Macmahon Community School in Tulaghi Island during Operation Render Safe 2013. Top Right: HMAS Labuan opens the bow door to receive stores in Port of Honiara during Operation Render Safe 2013 in Solomon Islands. Bottom Left: HMAS Labuan receive stores in Port of Honiara during Operation Render Safe in Solomon Islands. Bottom Right: Locals watch as HMAS Labuan receives stores. With her International Fleet Review commitments completed, Labuan departed Australian waters to participate in Operation RENDER SAFE, an annual, Australian-led operation to help remove the explosive remnants of World War II (WWII) from the South West Pacific. The 2013 operation was conducted in the Solomon Islands in November and December. Some 200 Australian personnel from all three services were joined by the Royal Solomon Islands Police Force Explosive Ordnance Disposal Team as well as clearance divers from New Zealand, the USA and Canada. Less than 24 hours after the establishment of the operation headquarters in Honiara, the team located and made safe 21 pieces of unexploded WWII ordnance near Honiara International Airport. Over the course of the operation, which finished on 7 December, some 10,000 pieces of unexploded ordnance were located and either destroyed or made safe. Many of those items were found near villages, airport runways, beaches, coastal waters and even in community vegetable gardens. 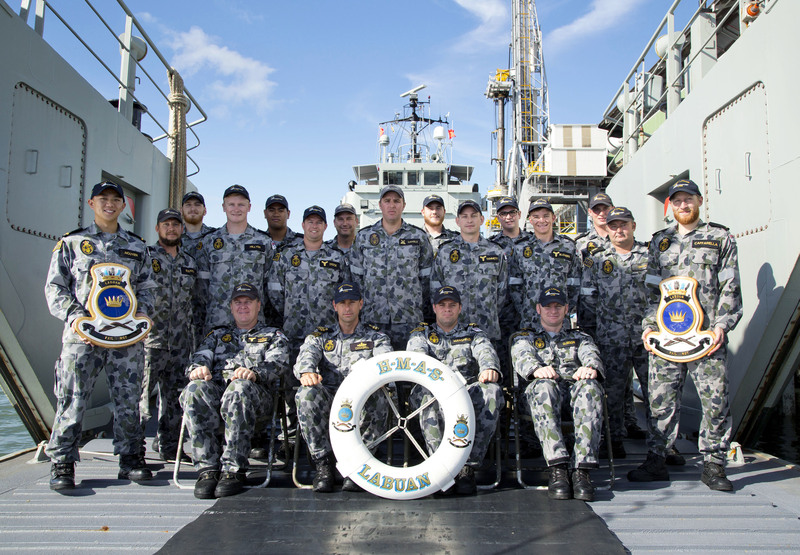 The crew of HMAS Labuan on the tank deck alongside their home port of HMAS Cairns, Queensland, 29 May 2014. 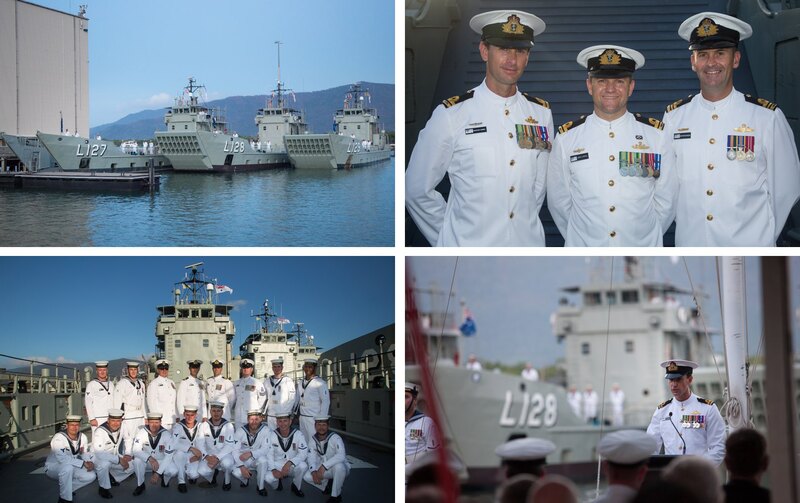 Top Left: HMA Ships Labuan and Tarakan outside HMAS Cairns Naval Base prior to sailing with HMAS Brunei for the Solomon Islands, 21 July 2014. Top Right: HMAS Labuan at anchor off Savo Island, Solomon Islands, 14 September 2014. Bottom Left: Members of HMAS Labuan's ship's company with the students and teachers of McMahon Community School at Tulaghi, Solomon Islands, 16 September 2014. 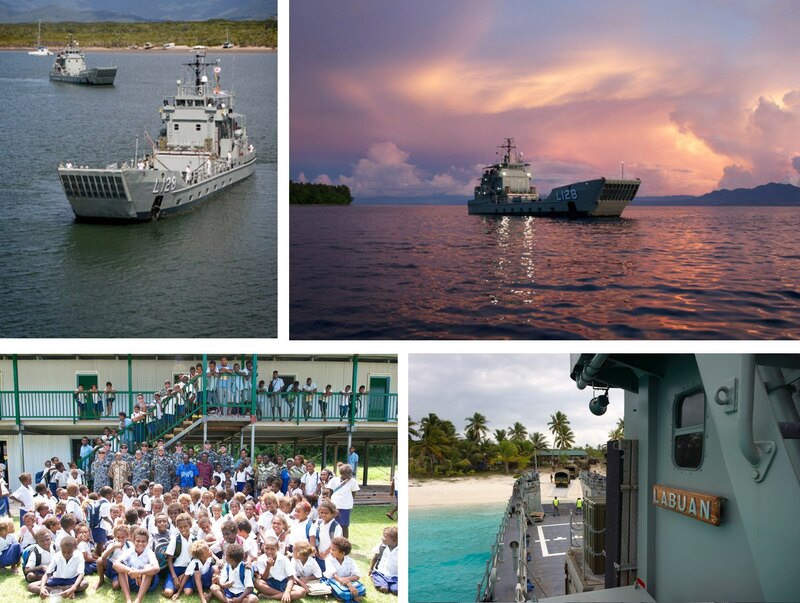 While in the Solomon Islands, the Landing Craft Heavy took delivery of education, medical and flood relief supplies and transported them to remote communities. Bottom Right: HMAS Labuan conducts amphibious operations on the island of Lifou, New Caledonia during Exercise Croix du Sud 2014.
of commanding her for short periods. Top Left: The ships companies of HMA Ships Brunei, Labuan and Tarakan man ship at the beginning of the Landing Craft Heavy decommissioning ceremony. Top Right: (From left) Commanding Officer HMAS Labuan, Lieutenant Christopher Cockerill, RAN, Commanding Officer HMAS Tarakan, Lieutenant James Carroll, RAN and Commanding Officer HMAS Brunei, Lieutenant Commander Matthew Richardson, RAN on the tank deck of Brunei prior to the decommissioning ceremony. Bottom Left: The ship’s company of HMAS Labuan pose for a photo on the tank deck of Brunei. Bottom Right: The Commanding Officer of HMAS Labuan, Lieutenant Christopher Cockerill, RAN addresses the audience.